Three years have passed since Azerbaijani army’s victory in April 2016 clashes. 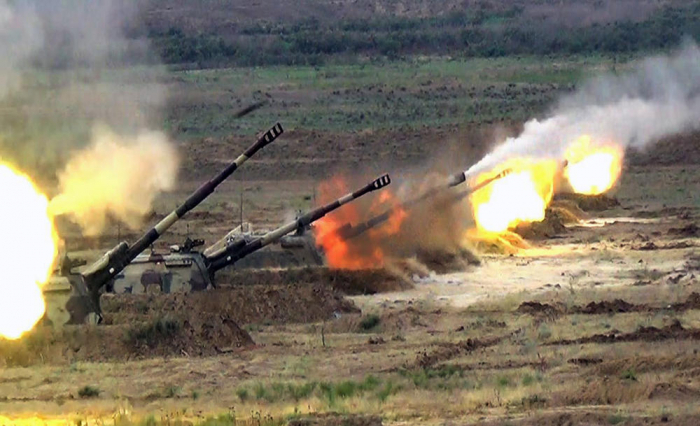 On the night of April 2, 2016 and during the day, all the frontier positions and settlements of Azerbaijan were subjected to heavy fire by the Armenian Armed Forces. Six civilians were killed, including two children aged under 16, and 26 people were injured as a result of shelling of Azerbaijan’s settlements located along the line of contact by Armenia. Numerous public and private facilities, including civil infrastructure, were severely damaged as a result of the offensive, 232 houses, 99 power transmission line poles, three electric power substations, kilometers of water and gas pipes were destroyed. The Armenian Armed Forces launched the guided-missiles at social institutions, including schools, hospitals and places of worship. Large-caliber artillery shells fell during the prayer service in one of the mosques. In order to suppress the Armenian provocation, ensure safety of the civilian population, the Azerbaijani Armed Forces command made a decision to take urgent response measures in the Aghdere-Tartar-Aghdam and Khojavand-Fuzuli directions. As a result, during the four days of fighting, Azerbaijani Armed Forces liberated the heights near the Talish village, as well as the Seysulan point, which could pose a threat to the safety of Goranboy district and the city of Naftalan. The Lele Tepe strategic height located in the direction of the Fuzuli district and allowing controlling a vast territory was taken under control. Also, as a result of the April fighting, the Azerbaijani Armed Forces ensured control over the roads in the Aghdere-Madaghiz direction. As many as 30 tanks, up to 15 armored guns and fortifications belonging to the Armenians were destroyed, 320 Armenian soldiers were killed and more than 500 servicemen of the enemy were wounded during the clashes. The military operations were stopped on the line of contact between Azerbaijani and Armenian armies on Apr. 5 at 12:00 (UTC/GMT + 4 hours) with the consent of the sides. As a result of the successful counteroffensive, more than 2,000 hectares of territory were liberated from the Armenian occupation, even a larger territory came under the control of the Azerbaijani army. Azerbaijani Armed Forces have fortified the liberated lands. In general, the April fights have demonstrated the attention paid by Azerbaijani President and Supreme Commander-in-Chief of the Armed Forces Ilham Aliyev to the army, as well as high fighting efficiency of the Azerbaijani army and the ability of the Azerbaijani Armed Forces to liberate the occupied territories at any time. Azerbaijani army’s victories in the April battles have laid the foundation of the liberation of Azerbaijani lands from the Armenian occupation.